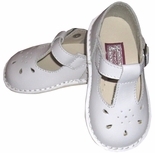 We carry childrens shoes for girls and boys including girl's and boy's white dress shoes. Our baby shoes for girls and boys include monogrammed baby shoes, personalized baby shoes and baby walking shoes made by L'Amour and Baby Deer. Monogrammed baby shoes include fabric and leather crib shoes with soft soles. Our shoes are perfect for portraits, church and special occasions including Christening.They are perfect to wear to school, church and special occasions. 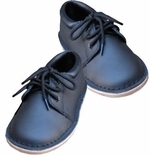 Our baby shoes also include baby walking shoes to give babies and toddlers support at the ankles. We offer Mary Jane shoes for baby girls and toddler girls.